3herosoft PSP Video Converter is a powerful PSP Video Conversion tool, which can convert all popular video formats to Sony PSP. 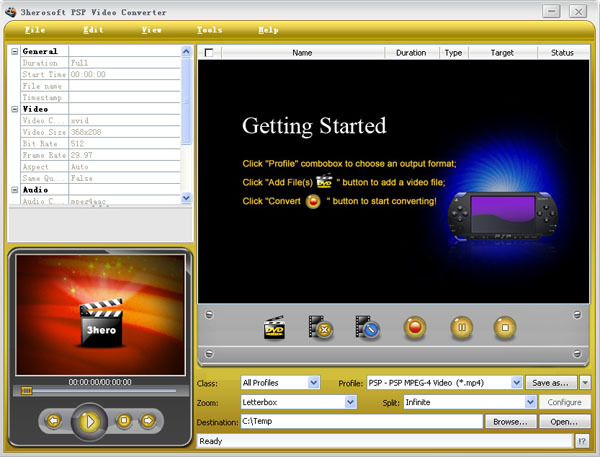 It can both convert video to PSP movie (PSP MP4 video, PSP H.264/AVC video), PS3 Video MPEG-4 (480p, 720p, 1080i) and extract audio from video to MP3 and M4A.3herosoft PSP Video Converter support almost all popular video formats such as AVI, MPEG, WMV, DivX, MOV, RM, DAT, VOB, 3GP, etc. ...... encoder settings, batch conversion and so on. The conversion will be finished in a few clicks, then you can put the converted video onto your Sony PSP for you to enjoy anywhere and anytime. Turn your Sony PSP player into a 16:9 wide screen movie theatre with 3herosoft PSP Video Converter now! Qweas is providing links to 3herosoft PSP Video Converter 3.8.8.0214 as a courtesy, and makes no representations regarding 3herosoft PSP Video Converter or any other applications or any information related thereto. Any questions, complaints or claims regarding this application 3herosoft PSP Video Converter 3.8.8.0214 must be directed to the appropriate software vendor. You may click the publisher link of 3herosoft PSP Video Converter on the top of this page to get more details about the vendor.